This little project combined 2 of my favorite things and it was super-duper easy. For those of you who don't drink coffee, you can use this to keep your fingers cool with any hot beverage. Hot chocolate anyone?? A coffee sleeve like the ones from Starbucks or 7 Eleven (this is to trace for your pattern). Fabric for the sleeve. If you want to make it reversible use 2 different patterned fabrics. Trace your coffee sleeve onto a piece of paper. Stack your fabric and felts and place the pattern on top. Pin them all together. TIP: Stack the fabric how you will sew it. Place the felt on the bottom, followed by the first piece of fabric FACE UP. Top with your second piece of fabric FACE DOWN. This will make it more even in case one side is a little different than the other. Trust me. I make the mistakes so you don't have to. 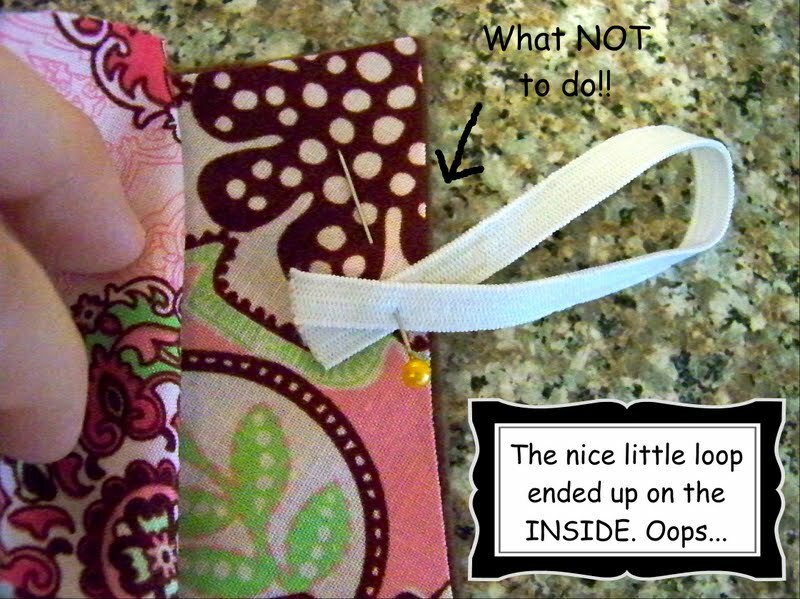 Place your piece of elastic in between the to top pieces of fabric in a loop. The loop will be INSIDE the pieces of fabric and just the little tail will be sticking out. You can also idiot-proof this by using a hairband that has been squeezed together in the middle. Sew everything together, leaving a space at the top or bottom to flip it right side out. Once it is right-side out, iron the cozy to make it nice and smooth. Also, iron the folds on the open space so it will look nicer when you sew it together. From here you can hand stitch the gap or use your machine. Wrap the cozy around a standard sized coffee cup and mark where the button will go. Sew on your button and you are ready to go. To make it reversible put a button on the other side in the same spot. send you an e-mail. I've got some creative ideas for your blog you might be interested in hearing. Either way, great site and I look forward to seeing it improve over time. I know this website gives quality based articles and other stuff, is there any other web page which offers these kinds of things in quality? writing a blog. I book-marked it to my bookmark website list and will be checking back soon. last component. look into for Verisign or Cybertrust. in spades helps companies in bod to aid you get ahead the fauna out. You can use these in your people and slope accounts.